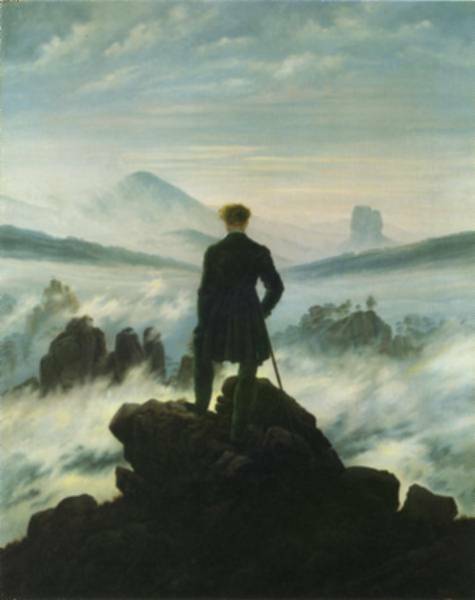 Wanderer above the Sea of Fog 1818; Oil on canvas, 94 x 74.8 cm; Kunsthalle, Hamburg The German romantic painter Caspar David Friedrich, b. Sept. 5, 1774, d. May 7, 1840, was one of the greatest exponents in European art of the symbolic landscape.Some of Friedrich’s best-known paintings are expressions of a religious mysticism. Even some of Friedrich’s apparently nonsymbolic paintings contain inner meanings, clues to which are provided either by the artist’s writings or those of his literary friends. For example, a landscape showing a ruined abbey in the snow, Abbey with Oak Trees (1810; Schloss Charlottenburg, Berlin), can be appreciated on one level as a bleak, winter scene, but the painter also intended the composition to represent both the church shaken by the Reformation and the transitoriness of earthly things.